Amusement parks often have rides that are designed for young kids. One common type of ride that can provide a lot of fun is a miniature train. This is something that is made specifically to appear like a real train and even rides on actual train tracks. 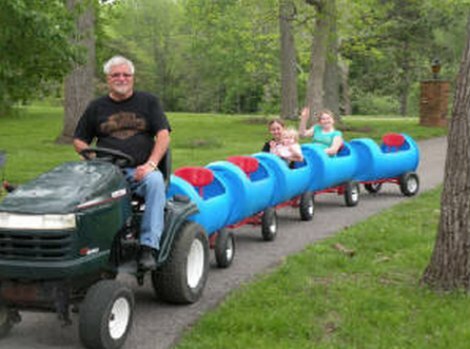 If you want to have something like this as a fun ride for little kids at home, then a barrel train car is a great option. The best thing about a barrel train car is the project is a fun DIY project to do on a weekend. All that is required is the proper parts and tools to complete the project. You can find most of the parts needed for this task online. However, a few parts can be found locally if you know where to look. You will be using a tractor or some other slow moving machine to pull a barrel train car. However, you will likely need to make two or maybe more as a single car might only be big enough for one child. The project will require an axle and wheels that need to be properly attached. A barrel train car is similar to a small wagon. You will be using a frame and a seat area for the car. Your best option is to use plastic barrels as this is the easiest material to customize. A few tools are needed if you want to make a barrel train car successfully. You will need to have a power drill to tap the frame to attach the pieces for a barrel train car. If you make more than one car, then a pin will be used to keep them attached. The most expensive part of this project is the metal frame. However, you may be able to make a frame from wood or other material.